It appears that an iconic piece of the 23rd century just landed at the University of British Columbia's SPIN Lab. It's called Cuddlebot, and it looks — and even responds — in a way that's eerily reminiscent of Star Trek's tribbles. Developed by Anna Flagg, it can sense and react to nine different kinds of gestures. 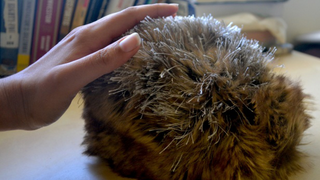 By using conductive fur, Cuddlebot can tell if someone's scratching it, tickling it, or blowing on it — and, after a while, can even tell who's doing it. Flagg unveiled Cuddlebot at the IEEE Haptics Symposium last year and will be showing it off at a conference in Barcelona in a few weeks. The purpose of Cuddlebot is to test whether innovative and imaginative robots like this can be made to recognize touch and respond in appropriate ways. Other members of the SPIN lab are training machines to infer emotions from the gestures they recognize–the second part of the grand plan. Eventually, Flagg told me, bots like the Cuddlebot could become companions with therapeutic uses in hospitals. Cuddlebot has already participated in tests with kids and probably unsurpringly, was a hit. But healthy adults could use Cuddlebot too. I've written about a cell phone hack that sent tactile messages to your conversation partner as you talked. I mentioned this to Flagg, who agreed that a Cuddlebot-inspired furry cover may come in handy in such an instance. One day, it may even correctly infer the emotion being sent. Flagg's collaborator Karen MacLean has said that a pocket-sized Cuddleblot, perhaps tucked away in your purse, could be useful as a portable stress detector. Connected with your phone, it might know when to bother you with certain alerts, and when not to. Images: Anna Flagg via MIT.